I'm posting a little earlier than usual today because we're hitting the road for my brother-in-law's wedding! The kids are excited to see their grandparents and to see Uncle Jarrad get married. I'm excited for both of those things, and to take a day off of work. But first, there's a job to be done, and that is to eat one more thing this week. I've mentioned already that I had a few foods in mind at the start of this project, and one of those was Vegemite. In case you've never heard of it, let me just describe it to you so you can decide just how appetizing it sounds. From Wikipedia: "Vegemite is a dark brown food paste made from yeast extract." I know all of the words in that sentence, but they just don't belong together. "Food paste"? That sounds like what they feed you if you're in the hospital on a liquid diet. It is most famous in the USA for being mentioned in the second verse of the Men At Work song "Down Under." Where was I to find this brown, yeasty spread? Thanks to the song, I knew it was primarily popular in Australia, so I called the one person I know who has ties to that country (though I think she actually grew up in New Zealand), my friend and former co-worker Carly. "(After explaining my project to her) Carly, I know that I'm engaging in a complete stereotype by even asking this, but do you know anybody who could send me some Vegemite?" "You can get it here, in Lubbock, at the World Market, but you shouldn't buy any." "It's eight dollars a jar, and you're going to hate it." "Well, I haven't even tried -"
"You're going to HATE it." "I have a jar at home. I'll bring you a little bit of it to try. You're going to hate it." It's good to have friends who will be generous with you. I only begrudgingly share my Nutella with my children, and they are my own blood. But here's Carly, who is an awesome friend already, sharing her very expensive Australian imported chow with me, and even warning me about it. You know what? I did NOT hate this! It is definitely a dining experience of its very own, and a little bit of it goes a long way, but it was, well, kind of good. Like I mentioned in the video, it's like very salty beef buillon. Oooh! You know what would be good? If you found a way to mix this into a Bloody Mary. I think I know what drinks I'll be serving at the wrap party. And speaking of the party, this is your last weekend to put your name in the drawing for an invitation. The deadline is midnight on Monday. I hope to see you there! Jack is AWESOME in this video! You weren't kidding about being stingy w/ the Nutella! Another really good read/watch, Danny. This blog should be renamed: Daddy tries to blog. At least it's a family affair! :) Good on ya Danny! Throw another shrimp on the barbie!! A friend of mine told me that veggiemite is made from the left over sediment from brewing beer. Yeast extract. By the way, turning a potato cannon into a durion cannon could be fun. Roy and Andrea - Jack was absolutely the star of this one. It put me in a good mood that he wanted to hang out in my lap. John - Your friend is exactly right. I don't know if you're right about the cannon, though. Durian has the disadvantage of being much more expensive than potatoes. It has the advantage, though, of being much more unpleasant for the person you're firing it at. It may be classified as a biological weapon. I remember my brother told me a long time ago that they actually scrape the stuff off the bottom of used kegs and that's vegemite. I'm impressed that he was right. I mean it sounds so made up. On a side note, I love how literal the videos were in the 80s. I mean, the guy is actually 6'4", muscular, he really smiles, hands the other guy a vegemite sandwich and then says "We come from a land down under." I mean, have you seen Lady Gaga's videos? They don't have anything to do with anything! Kyle - if you ever feel like sending an hour or two down the rabbit hole, go to YouTube and search for "literal music video." People take music videos (mostly ones from the 80s) and record new vocal tracks (preferably in the style of the original) which describe exactly what's happening in the video. Some of them are really funny. My favorites include Total Eclipse of the Heart, Take On Me, and Head Over Heels. I don't think Down Under will ever get the treatment, though, because like you said, they just put it all right there onscreen already! 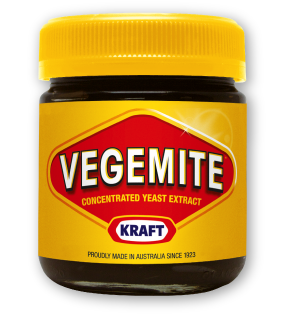 honest to goodness - i thought vegemite was made up. you have broadened my horizons. with vegemite. now that's just sad. you weren't kidding. you really WON'T share your nutella with your children. all three of them are trying to get at it and you deftly thwart their every effort right up to the end! and, even then, i think you were just distracted by the video taping, or you would have emerged victorious.